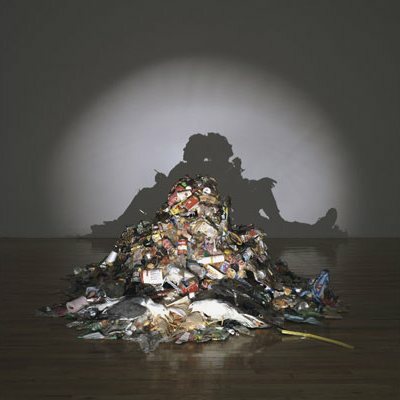 Art or Farce? 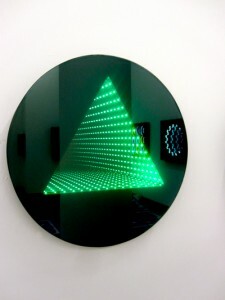 » Light/Illumination - Is it art? Is it crap? You decide. Nasty. 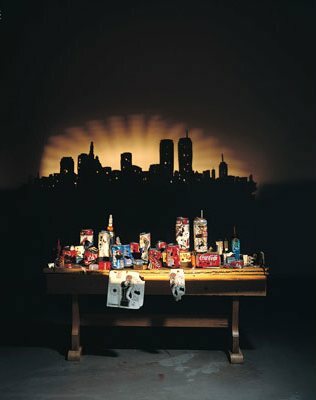 There really isn’t another word to describe the works of Tim Noble and Sue Webster. The British duo have collaborated on projects since 1996 that have spanned the realms of light and shadow, illumination and the dark, yet are, for all intents and purposes, trash. Don’t assume that this is any critique of the work from the connotation of the word. The artists may take the statement as a compliment. While Noble and Webster create many lighted sculptures, another oft-used medium of the pair is that of used goods (i.e. trash). 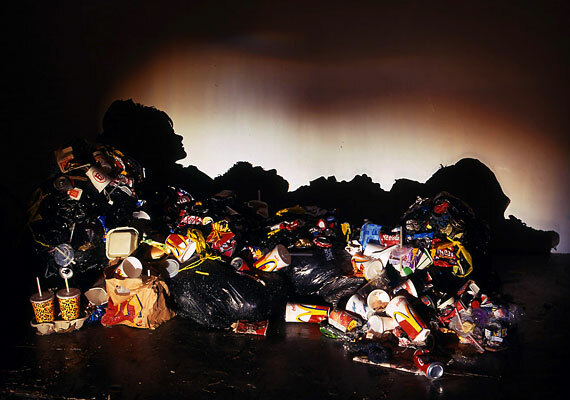 The work that Noble and Webster display, however, is not just the created pile of trash (which in the case of Dirty White Trash was 6 collected months of the artists’ trash and a pair of dead seagulls), but the projection of the shadow of the work from a fixed position. Their first shadow sculpture, Miss Understood and Mr Meanor, drew huge crowds when they exhibited it in 1997. 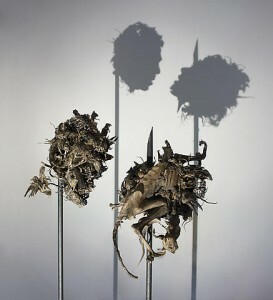 Keeping with the theme of heads on pikes, Noble and Webster presented Dark Stuff over a decade later: another pair of unfortunate crania, this time crafted out of 189 mummified animals including rats, crows, and a fox. 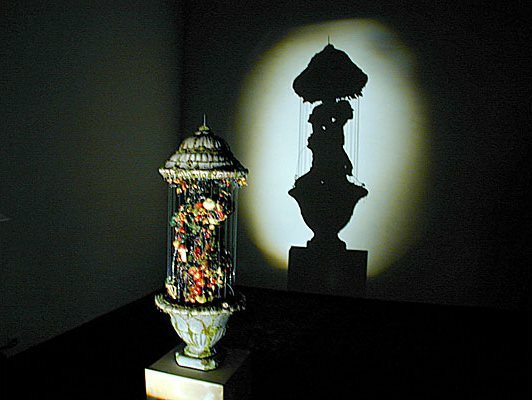 The shadow work of the artists is not always as macabre as impaled, disembodied heads. Quite a bit of their work, both light and shadow, is lighthearted and easily relatable, or at the very least, uninterested in the topic of death, at least on the surface. A common focus in their shadow sculptures are couples (Noble and Webster having been partners for some time before marrying in 2008 may have played a part in their subject matter), many which are seen as self portraits. Each work is painstakingly created out of innumerable pieces of trash, each painstakingly placed to ensure the shadow is created with striking detail. 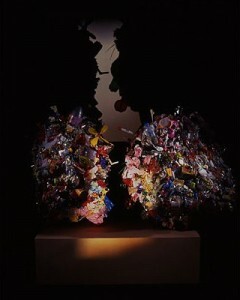 But not all of their works are based on a pair of lovers or compatriots. Sunset Over Manhattan brings a skyline to life out of aluminum cans, peppered with holes created by air pistols. 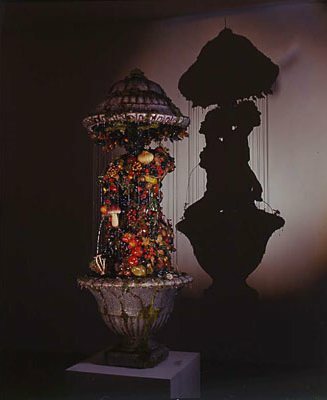 While each work is designed to be viewed from a certain perspective for the shadow to appear properly, not all works have a single shadow. For Cheap and Nasty, an electronic mechanism rotates the pair of faces between two different views. The work at once shows duality within a person, a being and a faÃ§ade, each hidden in the shadow of the other. 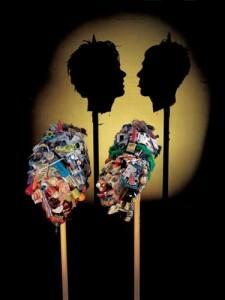 Yet, at the very heart of their pieces, there is a universally dirty, yet natural and accepted, quality to their work. Are Noble and Webster’s sculptures nasty, or are they just plain rubbish? Let us know below. 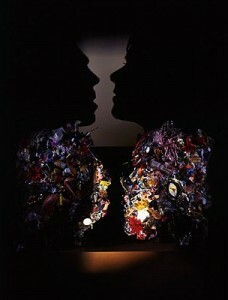 Photos courtesy ofDeitch and Gagosian. Geometric shapes and neon lights befitting of the next TRON reboot fill the studio space of this Brooklyn-born artist. Paul Kolker has made a name for himself out of his integration of mathematical theory and scientific concepts to his painting and other artworks. It’s no surprise that this former chief of cardiothoracic surgery applies so much quantitative process to his works to depict them qualitatively. 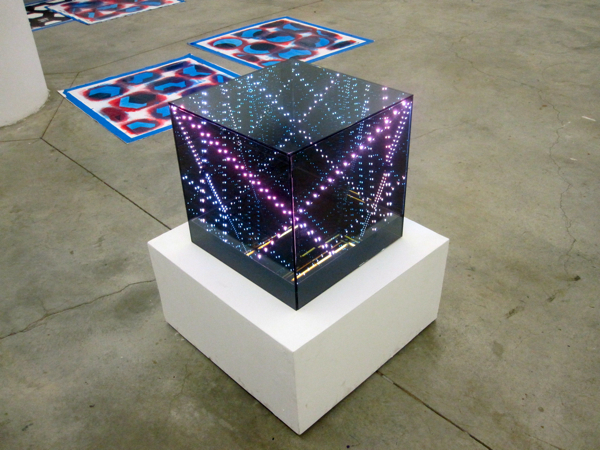 A number of Paul Kolker’s works implement his own color and art theory he has dubbed “fracolor.” This process transforms an image into pixelated dots of fractal components of the original. The result is a very clear representation of the image from afar but a very fractured and almost abstract grouping of circles when viewed closely. 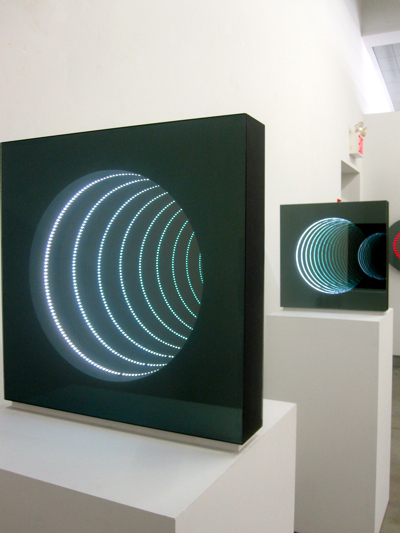 In his current installation, Let There Be Light!, Kolker displays a selection of his unique light “sculptures,” exploring depth and physical space in concrete forms via illumination. Similar to the fracolor experience, the lights in each group are little more than individual dots alone (even less than the paintings as their very being is a testament to their impermanence) yet create an image much more substantive than the shape it is symbolizing. 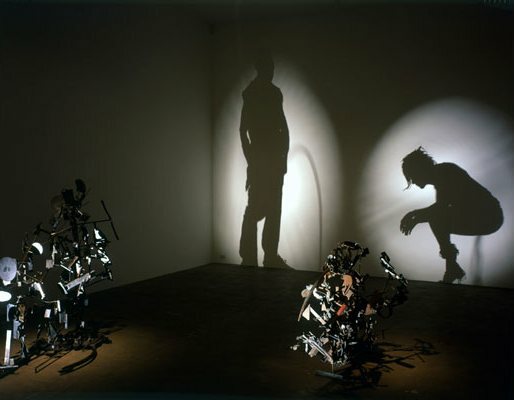 Kolker’s “sculptures” are simply meant to be seen to be wholly appreciated. The fullness of Kolker’s Star Light, Star Bright for instance is difficult to capture in a photograph, especially when depth and angle are such intricate facets of the work. The best living example of this is this photograph of the above mentioned work. Can light have form, or will Kolker’s work vanish into darkness? Make your choice below. Photos courtesy of Opening Ceremony. Let There Be Light! can be viewed at Studio 601 through May 5th.